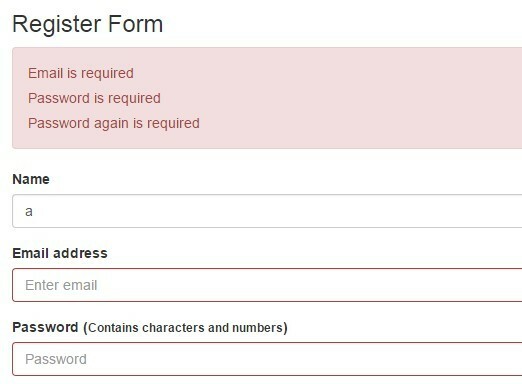 All the Free jQuery Plugins about 'form validation' are listed here. VaSe is a versatile form manipulation plugin for jQuery that validates the form fields and send the valid form data to the server using AJAX post. Validin is a lightweight, easy-to-use jQuery plugin used to validate various types of form fields using regular expressions. 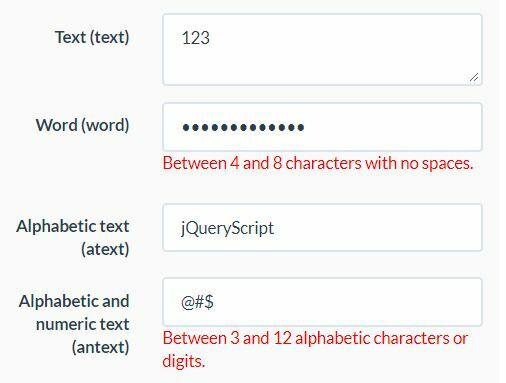 10 Best jQuery form validation plugins to validate your HTML form with custom styles, error messages and validation rules. 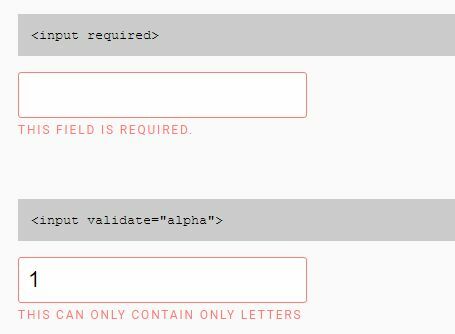 Validati is a flexible jQuery form validation plugin which highlights invalid form fields and displays custom error messages using CSS classes and HTML5 data attributes. mobileValidate is a highly customizable jQuery form validation plugin optimized for mobile devices. A robust, flexible, customizable and modular form validator that supports both native HTML5 form validation features and custom validation rules. DjValidator is a simple, flexible, powerful jQuery based HTML5 form validator that comes with 20+ built-in validation rules and is easy to extend using your own validations. A lightweight (3kb) jQuery form validation plugin used for validating your form fields on keyup and/or submit. 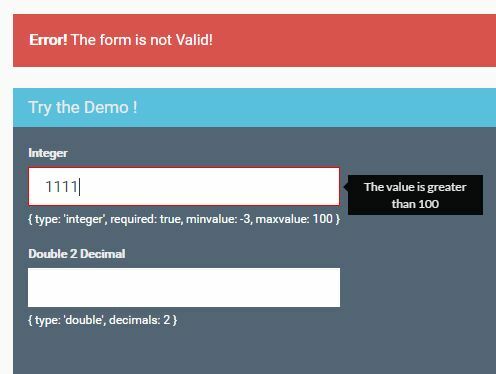 validity.js is a small jQuery HTML5 form validation plugin used to validate the values of any form fields using the HTML validity property. Prove.js is a robust jQuery plugin that provides modular, event-based, synchronous or asynchronous validators and decorators for your existing form fields. ValidMYCard is a Credit Card Generator & Validator built with jQuery that generates random credit card numbers and checks you type the right numbers (card type, length, luhn). 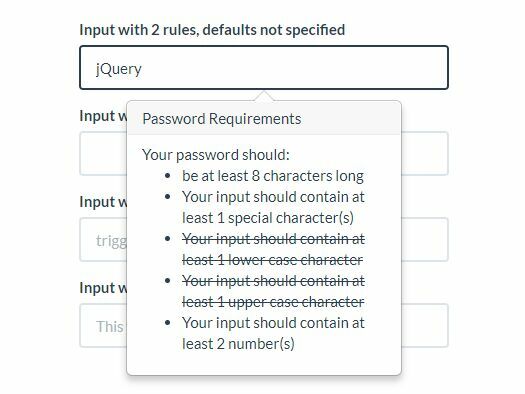 PassRequirements is a jQuery plugin that uses Bootstrap's tooltip component to provides an instant feedback when an input field (typically password field) meets certain requirements. smValidator is a lightweight jQuery form validator styling with Bootstrap that can be used to validate various types of input fields with custom error messages. ssd-form is a lightweight, configurable jQuery plugin which adds form field validation and ajax submission functionalities to your existing html form. Smart Formatter is a jQuery form formatter plugin which automatically formats form fields (e.g. input fields, textarea elements) while typing. fm.validator.jquery.js is an easy-to-implement yet fully configurable jQuery form validation plugin to help you validate input, textarea, checkbox, select, and radio button on client side. field-validator.js is a simple, powerful jQuery form validation plugin which enables you to validate and auto-format form fields on the client side. datetextentry is a jQuery based date input widget that separates the standard text input field for day, month and year, and performs a real-time date validation while the user typing. aria-validate is a simple, accessible, client side form field validation plugin for jQuery that uses Aria attributes and roles for keyboard and screen reader accessibility. 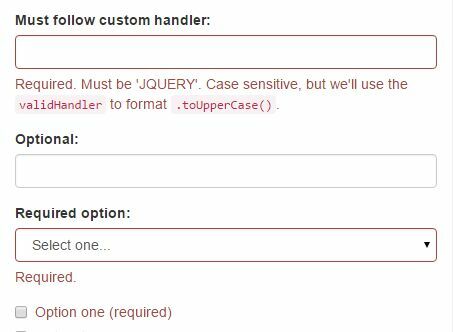 prettyFormError is a lightweight jQuery plugin which provides custom CSS styles for the regular HTML5 form validation error messages as shown in the demo page. numberValidation is a simple, easy-to-use jQuery plugin that provides the real-time validation functionality for your numeric input fields. validator.js is a small jQuery form validation plugin for Bootstrap framework that currently comes with 6 validators: 'required', 'length', 'or', 'equals', 'callback' and custom REGEX patterns. Parsley.js is a powerful, feature-rich jQuery form validation plugin which can be used to dynamically validate form fields on client side before submitting. 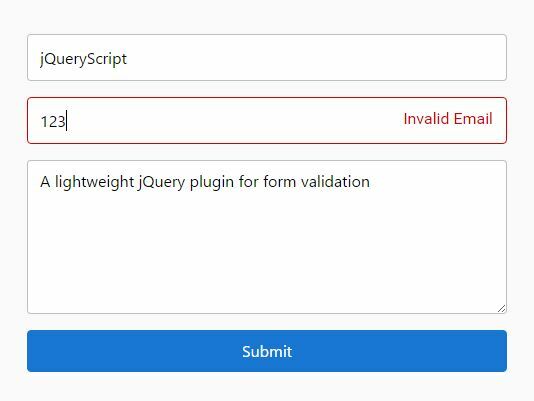 Validaty is a simple, flexible jQuery form validation plugin which applies most commonly used validators to your existing form fields using HTML5 data attributes. 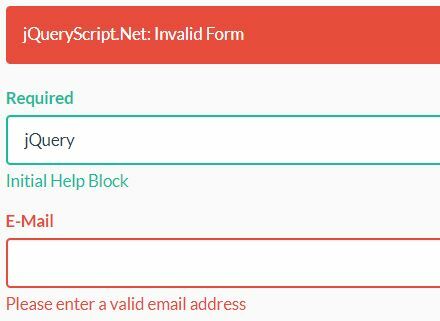 isform.js is a really small (~3kb minified) jQuery plugin that makes it easy to validate form fields and display custom error messages before submitting. 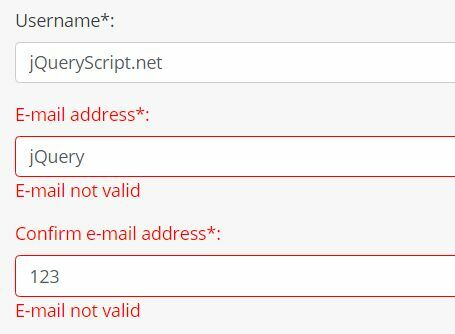 validex.js is a really small jQuery form validation plugin which highlights the form fields when the values typed by the user are invalid. A jQuery plugin to create an user-friendly credit card input that has the ability to detect the credit card type and validate the credit card number you typed. Bootstrap Validator makes uses of jQuery and HTML5 attributes to provide flexible, customizable and AJAX-enabled validation functionalities for your Bootstrap forms. validate.js is a lightweight client-side form validation plugin for jQuery that allows to validate and mask form fields using HTML5 data attributes and/or regular expressions. bsValidate is a simple lightweight jQuery plugin used to validate required/email/character text fields for your Bootstrap forms before submitting. Validetta is a clean and simple jQuery client-side and real-time form validation plugin that checks the required field, email, number, credit card, and more other input fields while submitting. An ultra-light, AJAX-enabeld, jQuery based form validator which can be used to validate required form fields and email addresses on client side. 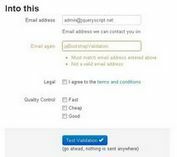 validateMe is a simple-to-use jQuery plugin used to validation form fields on client side that currently supports required fields, email addresses and telephone numbers. 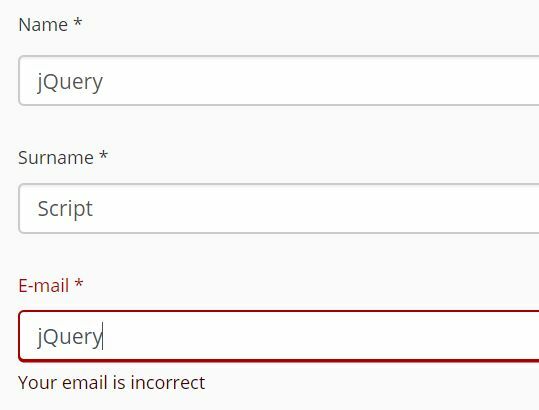 Valida is an easy yet fully configurable jQuery form validation plugin which checks form fields and alert users about errors when they fill in a form. 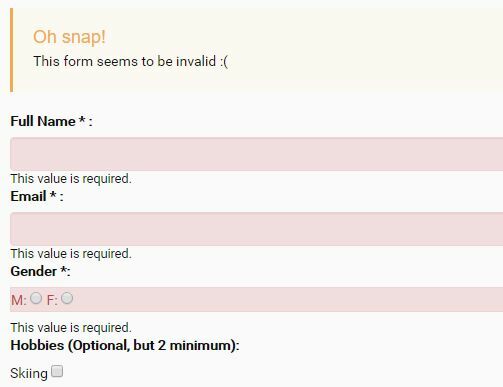 Snapkit Validation is a lightweight and easy-to-use jQuery plugin which applies most commonly used validation rules to your html form fields. A lightweight and accessible jQuery form validation plugin which has the ability to validate the form fields using aria attributes. An useful jQuery Plugin for detecting and validating credit card numbers. 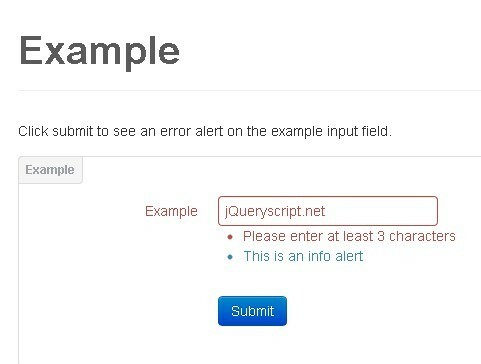 denetmen.js is a minimal jQuery form validation plugin which checks if text fields are empty with custom alert messages and optional lightbox integration. jQuery Payment is an useful and simple jQuery plugin for E-commerce website to format and validate credit card form input field. alex-date-time.js is a lightweight and convenient jQuery input mask plugin which automatically formats and validates date & time inputs in "DD/MM/YYYY" and "HH:MM" formats. 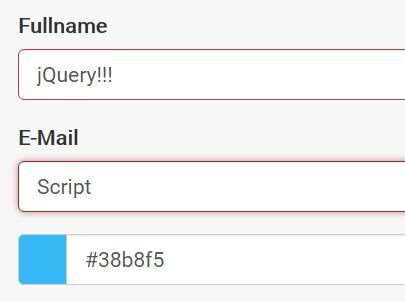 Attrvalidate is a jQuery form validator plugin which allows to validate your form fields using HTML5 input attributes such as 'required', min/max length, email, tel, etc. A jQuery plugin that allows to validate form controls with custom error messages and styles using Bootstrap styling, HTML5 attributes and regular expressions. A simple, easy, fast jQuery plugin that adds client-side form validation functionality to existing form fields. A convenient form validation plugin that provides a convenient means to implement client-side validation on common HTML input fields. Validator is a brand new jQuery form validation plugin that that makes it easy to add validation to existing form elements. Form Animation is a super tiny jQuery plugin which uses Animate.css to add cool CSS3 animations to your invalid form when submitting. ADA Validation is a jQuery based form validator that provides ADA compliant, client-side validation on existing form fields using REGEX, required, or custom validation functions. 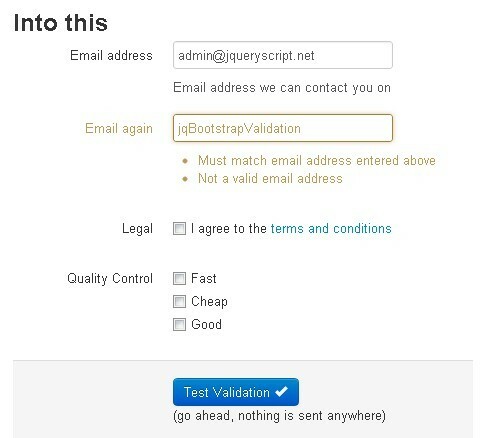 Validatr is a simple to use jQuery plugin which provides basic form validation functionality for required, email and zip input fields. iForm is a jQuery plugin that automatically corrects any user input, performing validation routines behind the scene. 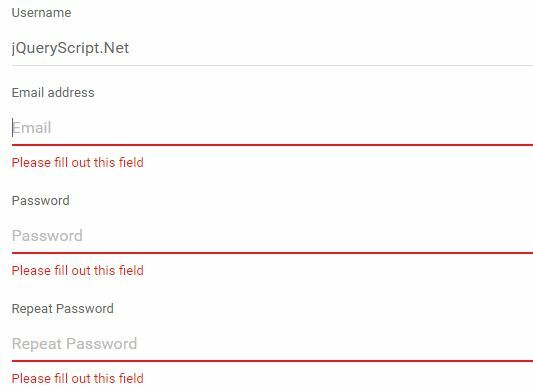 Validify.js is a very small jQuery plugin which provides real-time, client side input field validation on your login form. Cardcheck.js is a very small jQuery plugin for e-commerce website that validates the credit card numbers as well as telling you the detected credit card type. 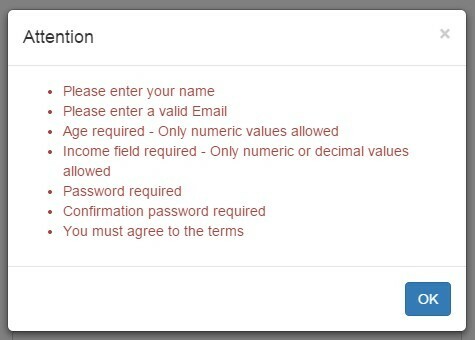 A jQuery plugin designed for user register form that displays a validation hint if the "Confirm Password" doesn't matches the "Password" field while the user it typing. 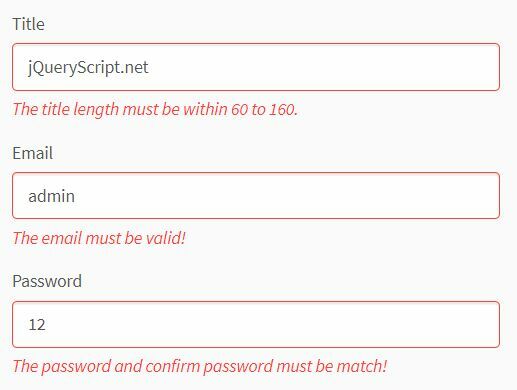 Valideater is a lightweight jQuery/HTML5 form validator that displays custom erro messages next to the invalid form elements when typing or clicking on the submit button. html5cvm is a lightweight jQuery plugin for replacing the default HTML5 form validation messages that supports numerious validation types. A jQuery form validator for validating your HTML form fields against required field, string, email, password, regular expression, and many more. liveaddress is a jQuery plugin which takes advantage of LiveAddress API to add a powerful and real-time address verification to your form when submitting. 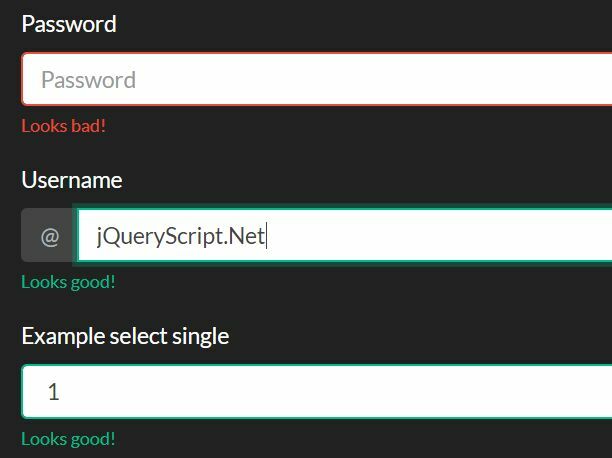 validate.js is a small jQuery client-side form validation plugin that utilizes RegEx patterns to add validation with custom error messages to existing form inputs. 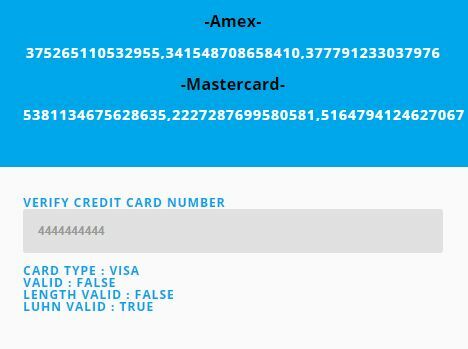 Force Card Number is a simple-to-use jQuery plugin helps you create an user-friendly debit/credit card input with card number validation. 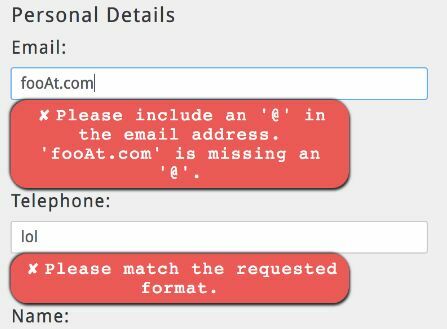 bValidator is a simple jQuery plugin for executing client side validation as you submit a form, displaying error & hint messages next to the invalid inputs. Pliant is a small jQuery validation plugin that allows easy extending/overriding of rules, as well as defining field validation by html comments. 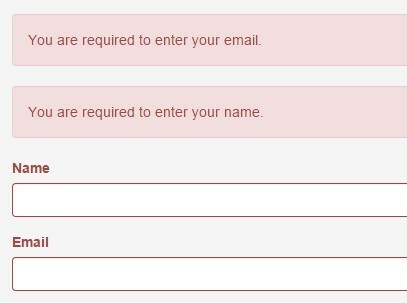 A basic jQuery & Bootstrap 3 based form validation plugin to validate login form controls such as email address, required fields, password fields, etc. A simple jQuery plugin to check and display the credit card type as the user types, and to provide Bootstrap validation classes for Luhn check once the correct length has been verified. 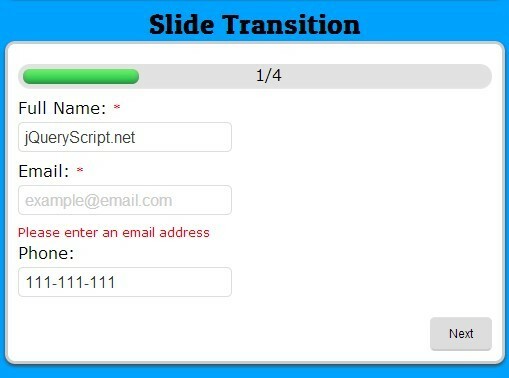 jFormslider is a jQuery plugin that converts a large form into a form slider/wizard with input validation, styling with Twitter's Bootstrap 3. Minimal Form is a simple jQuery plugin that generates a step-by-step form wizard with custom form validation rules via REGEX. 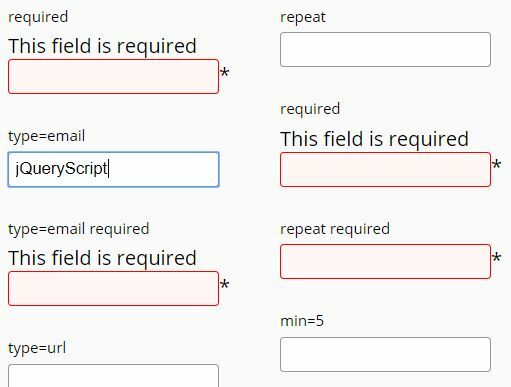 Simple Form is a jQuery plugin that turns a form into a multi-step wizard with support for form validation and progress indication. Goodness is a light jQuery form validation plugin. When the form is validated, classes will be added or removed from your markup to match your defined styles and animation. An easy yet useful jQuery plugin used to validate the form values your users input when clicking the submit button. validVal is a highly customizable and feature rich jQuery plugin that adds client side or server side form validation functionality to your existing form elements. Ideal Forms 3 is a form plugin for jQuery and jQuery UI that makes it easy to create a beautiful, responsive and extendable HTML5 step-by-step form for your project. 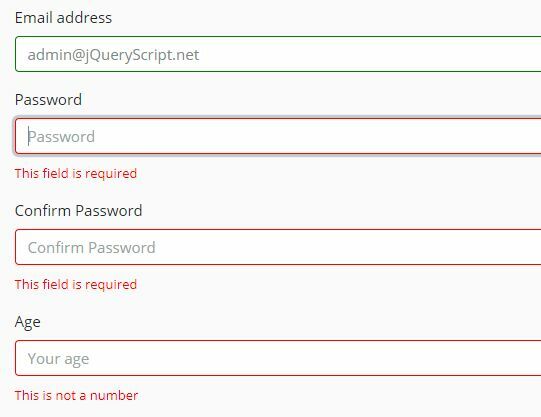 valideasy is a simple and easy jQuery plugin that adds form validation functionality to your input fields just by adding rule class attributes to your form fields. 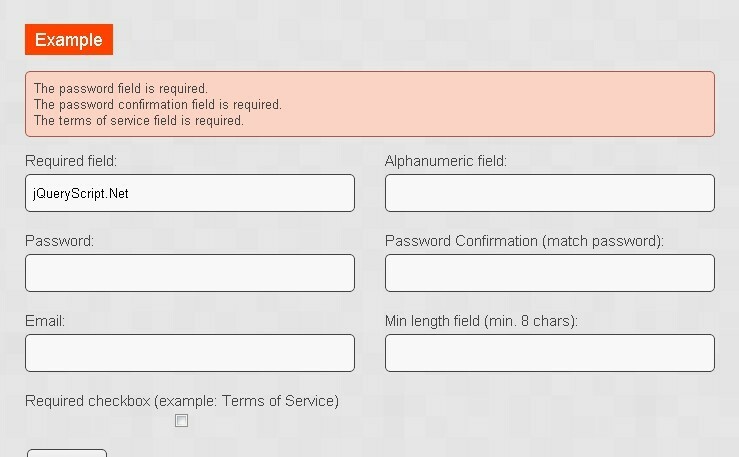 Bank is a simple and easy-to-use jQuery plugin that provides 2 APIs to format and validate bank account form inputs. formwizard is a powerful and useful jQuery plugin that turns the standard html form into wizard like step-by-step page flows without having to reload the page in between wizard steps.